In Japan, the most famous SF animation is "Mobile suit GUNDAM". From 1979 to now, There are many of each generation series has been broadcasting. 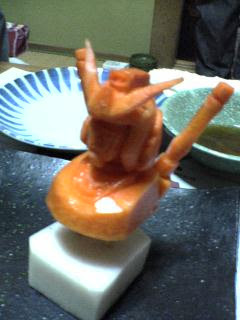 I made a several carving of this Animation. 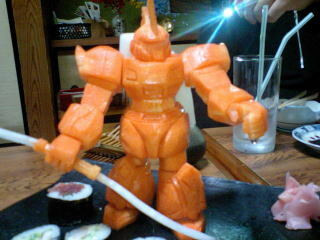 This carving needed a lot of parts just like Plastic model. I connect all parts with a bamboo skewer or a toothpick. The blade and shield(back) made by white radish. 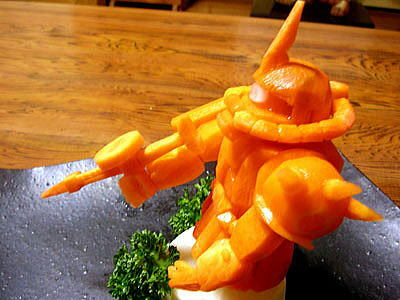 All of them are made by carrot.